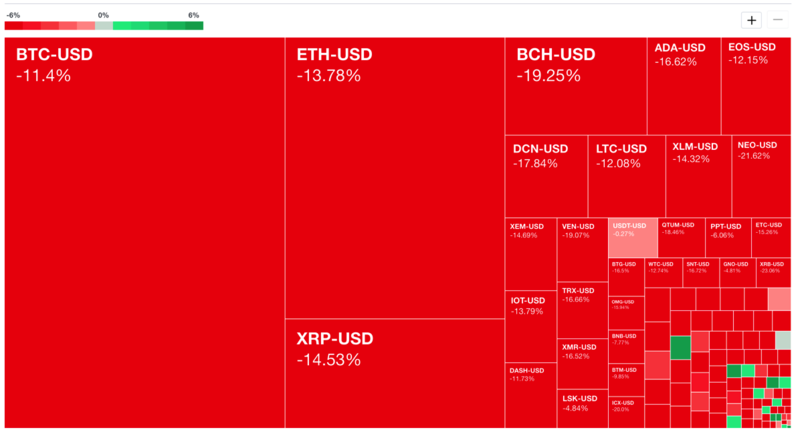 The cryptocurrency selloff continues, and if you look at the Yahoo cryptocurrencies heatmap, its pretty much all in the red. The WSJ reports, Bitcoin Is Falling Fast, Losing More Than Half Its Value in Six Weeks about the plunge, but what was interesting to me? Alex Beene, a 30-year-old from Nashville, Tenn., cashed out as the decline accelerated. He said he recently sold all his bitcoin, locking in a profit of over $60,000. Mr. Beene, who writes children’s books and works in the Tennessee Department of Labor and Workforce Development, said he bought most of his bitcoin in September, before prices surged over 500% in the following months. Smart man has locked in his gains! Is part of all this because China to stamp out cryptocurrency trading completely with ban on foreign platforms? Highlights: risks are still there, fuelled by illegal issuance, and even fraud and pyramid selling. So they don’t want you to use VPNs and going forward promoting this in China might be a crime in itself. Or is it because of this: Bitcoin could fall below $5,000 if this report on a mysterious cryptotoken is right?